Dislocated eyebrow, now that is really funny. I can remember a few boys in high school who grew their "mustache" but that description is much more accurate, lol. This is a funny photo...with the doll between them. This week I found a box of old photos from my family...back from the early 1900's...possibly the 30's and earlier. They seem creepy looking to me...but such fun going through them. I was encouraged by them...because most photos taken included their family pets...cats, and dogs. I figure if my family had a love for animals...no matter how scary they looked...they must have been loving people. People that love animals are usually kind and loving people...at least in my experience. A great photograph, I can see why it is one of the favourites from your collection. I have similar favourites - it is the fact that they record people in other than the set poses of family portraits. What a great photo! I wonder what they both are holding? They look like large spoons. As if the doll (or ventriloquist dummy) wasn't funny enough! What an interesting photo! I wonder if they were show people? 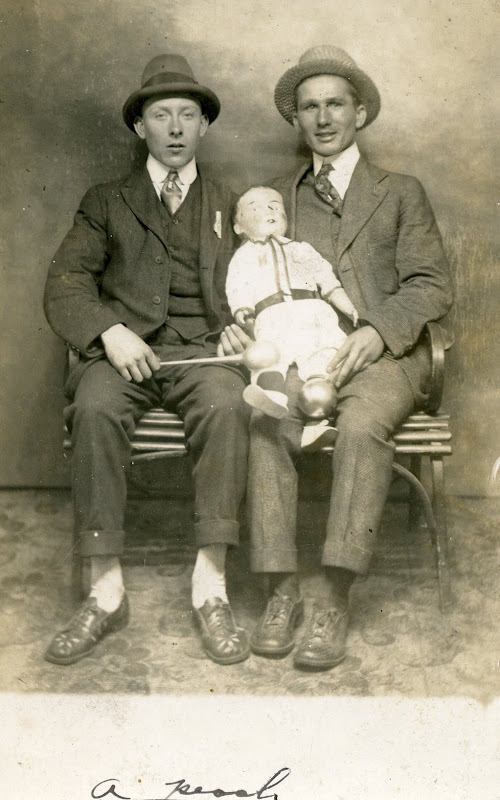 was the "dummy" a part of a ventriloquist act? And the trousers on the man on the left seem much too short? Ohhhh I wish I knew what was going on!!! Gosh, I'd sure like to hear the story behind this photograph. I was trying to see which young man had the "dislocated eyebrow" and finally decided it is the one on the right. Funny term. Thanks for sharing this wonderful photo. Oh what fun! Yest it does take something to try to surmise who they were, what they were doing, etc. That is one funy picture! You did a great commentary on it. I am not posting to Sepia this week, ran out of time, but reading and keeping busy inside out of the snow! What A Wonderful Soused Photo!!!! Thanks For The Martin Carthy.i've Seen Him Live A Couple Of Times.A Wizard.a True Star. Imagined Village Are A Band I Would Love To See Live.They Play Holmfirth in February & I'm Hoping To Get There & See Them. It is quite a different photo. They were young and wanted to do something silly. They look like extras from Boardwalk Empire!